You may call it confidence. You may even call it cockiness. But Jaylen Brown has it now and can back it up. Gone are the hesitation and tentativeness on the court. We all saw it early in the season. Jaylen would have an open look and pass up the shot, or he would have an open lane to the hoop and not take it. He was reluctant to drive to the hoop, and if he did he would have trouble finishing. Not any more! He has been aggressively taking - and hitting - his outside shots and taking it to the hole with authority, even against Lebron James. We saw that level of confidence in Paul Pierce. He would tell his defender what he was about to do, and then he would do it. Same with Larry Bird. And there was nothing either player's defender could do to stop them. Kind of like the classic scene from the movie, Billy Jack, where the main character played by Tom Laughlin tells his enemy that he is going to wop him on the side of his head with his foot and telling the opponent, "There's not a damn thing you're going to be able to do about it!" And as seen in the video below (at 1:02), Laughlin does just that. In the NBA, if you are going to brag and trash talk, you had better be able to back it up with your play. In the late 80's, young high school and college players were often coached not to wipe the bottoms of their sneakers at the foul line, a la Larry Bird, unless they were very, very good, thus avoiding ridicule by opponents when their level of play didn't match the cockiness. We still don't know just how good Brown is because he has not yet peaked. He is only 21 years old and still learning and improving - and gaining confidence. 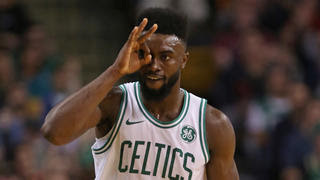 I can just imagine Jaylen saying the following: "I'm going to take this ball to the hole and jam it. And you want to know something? There's not a damn thing you're going to be able to do about it!" He used to be so quiet.